Boroondara’s trees and its native plants and animals, and activities that support the health of the environment. We value these things because they have an impact on the wellbeing of everyone now and into the future. We believe our community and Council are also in a good position to make a difference. Strategic Objective 2: Inviting and well-utilised community parks and green spaces. Strategy 2.1 - Sustainably design, manage and utilise parks and green spaces to foster a connected and healthy community for all ages and abilities. Strategy 2.2 - Identify opportunities to acquire or convert land within the municipality into new green spaces to provide more open space and recreation opportunities. Strategy 2.3 - Partner with other land owners to improve and provide further access to open space throughout the municipality. 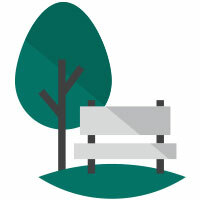 Strategy 2.4 - Activate existing green spaces and build social connection through the delivery of additional Council and community services and programs in our parks and gardens. Strategy 2.5 - Increase and improve public amenities and facilities in open spaces to enhance functionality for a wider range of uses. Strategy 2.6 - Improve the safety and comfort of the City’s open spaces by providing shade where a need has been identified. Strategy 2.7 - Manage, renew and preserve the green canopy in our open spaces and playgrounds for the enjoyment of future generations. We'll use the following high level indicators and data to assess our progress towards Strategic Objective 2. Detailed indicators will be published in the adjusted Council Plan 2017-21 and reported against in the Annual Report.